Tots! I think we joked that breakfast for dinner is a way to metaphorically start the new year. Or something ridiculous like that! Brinner is always a fave with the girls and it’s super easy to make and plan. Luckily, my over organizational skills have left my Pinterest in an array of boards according to my life. Quickly, I went to my Girls Night Ideas board to see what ideas I saved/pinned. Of course there were some Brinner ideas. 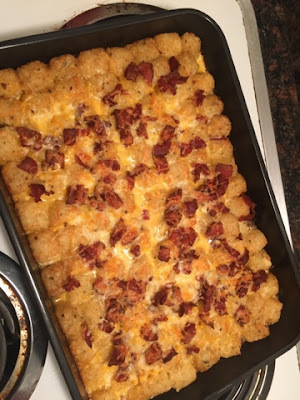 The Cheesy Tater Tot Breakfast Bake was my second choice, running up to my other pin — Egg Boats which wasn’t working correctly. 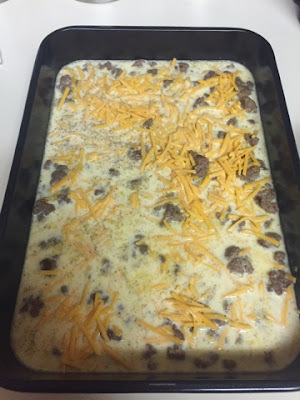 This recipe brought me to Amy at Chew Out Loud, kudos to her and her hubby’s blog! 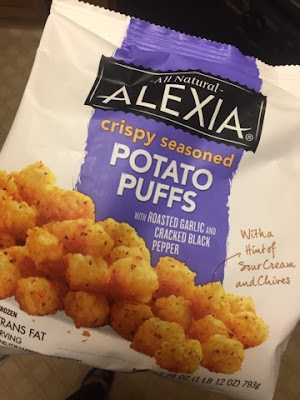 As we were grocery shopping at Safeway for the week, I grabbed most of the ingredients so I would be prepared to make this a day in advance and bake on the day of GN. sausage option, a little worried that some may not like it. I’m guessing everyone will be too nice to comment on it. I also just completely passed on the parsley for garnish, kids hate that stuff…and I think most adults do as well. Waste of money and time spent cutting it up! I loved that you could prep this dish and then finish it off and bake the day of. 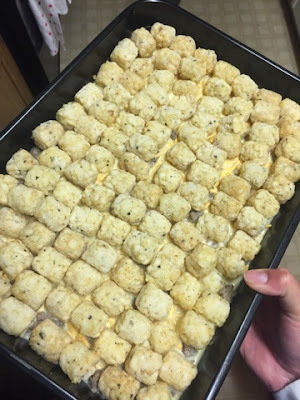 The only work on the day of was to add the frozen tots to the stuff I cooked the night before. However, there are two steps to the baking portion of the recipe, one of which I did when I got home from work, then the last step was done at Ang’s house to finish off the dish before we ate it. I can’t even fake the funk. This dish almost started WW III in our house. I didn’t think I had to tell J that I was saving the last bit of cheddar cheese for the final part of the recipe. I honestly didn’t think he’d touch it. Who adds shredded cheddar cheese to spaghetti? Seriously? That’s gross and pretty WT of him, if I’m being completely honest with you! He was a complete doll and started the oven, since he beat me home. He even pulled out the cooked bacon to be nice, which in hindsight I should have thanked him even though it wasn’t needed at that point. I added the tots in the most OCD way possible. I was so mad when they didn’t all fit perfect, even though originally I didn’t think I’d have enough — my bag wasn’t 2lbs like the recipe requested! I set my alarm for 25 minutes so I could nap, then go down and check on the dish. Of course, my phone is being dumb and the alarm didn’t sound. Luckily, I woke up on my own. Changed for GN and ran down to check on the dish. It was looking good! I went to grab the cheddar cheese…oh wait…its gone! This is basically where WW III went down. We probably didn’t need to argue about it, but damn — can a sister just get an “I’m sorry for using all your cheese” instead of a-hole comments as retort?! Anywho, I left in a furry and pissed that I didn’t have cheese to finish off the dish at Ang’s house. Yes — I know this isn’t an actual big deal in real life, just in my small world! Avo toast, quiche, a plethora of awesome cereals, chilaquiles, and yogurt parfaits made the Brinner complete. It was a small-ish group this time around, but still fully soul satisfying! Some serious conversation, some heart warming conversation, and everything in between while only three little lovebugs ran around laughing and enjoying themselves. Everyone seemed to like the dish — but it’s pretty hard to hate on tots, cheese, bacon, eggs, and sausage (turkey, haha)! I will be making this dish again, it was easy and tasty! I totally recommend making this for breakfast, brinner, or brunch! Despite the cheese using incident, this dish wins at everything!